Vintage 1952 Photo of Ferrari 225 Sport Vignale Berlinetta 0178ED at the start of the Mille Miglia. 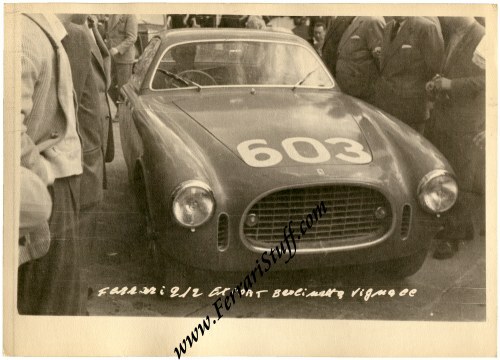 This is a genuine & vintage 1952 photo of the Ferrari 225 Sport Vignale Berlinetta 0178ED of Count Antonio Sterzi before the start of the Mille Miglia in Brescia on May 3, 1952. If I am not mistaken, we see the Count himself at the wheel in this photo. Apparently, the car was in a fire in the 1950's after which the engine and body got separated but both survive, albeit in different parts of the world. The photo measures some 7 x 5 inches (18 x 12.5 cm) and is matt, somewhat Sepia-toned black & white. It carries NO copyright notice. This is a vintage 1952 print, i.e. 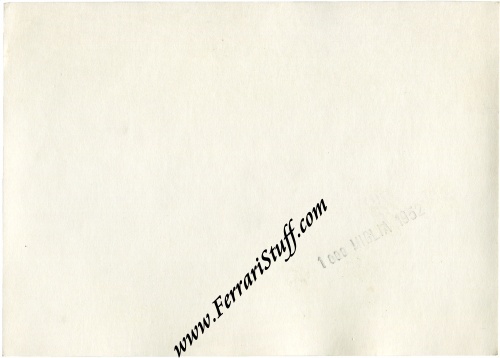 printed shortly after the original image was captured on film.